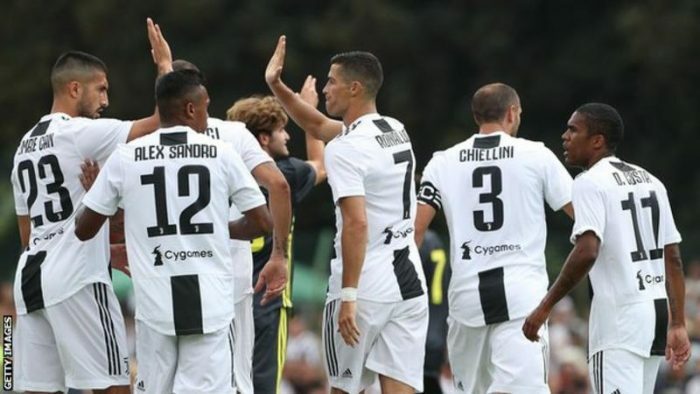 Cristiano Ronaldo marked his first game for Juventus with a goal as their first team beat the Italian side’s B team in an annual pre-season friendly. The game, between Juventus A and Juventus B, is played yearly in the town of Villar Perosa outside of Turin. The 33-year-old, who signed from Real Madrid for £99.2m in July, scored the first goal in Sunday’s 5-0 victory. The match was called off after 72 minutes due to the annual tradition of fans running onto the pitch.